Cesaro arrives at the arena and says he’s throwing a party. Apollo Crews pauses while working out to say that sometimes the impossible becomes possible. Sheamus doesn’t know why Apollo Crews is being given a chance at a chance for the US title. Alberto Del Rio doesn’t know who Apollo Crews is. They are all involved in a Fatal Four Way to decide the number one contender for the US title. Good match with a fairly surprising finish. All men looked good without anyone really outshining anyone else, which is a good thing. Crews hung in there well, and this was one of his better matches. 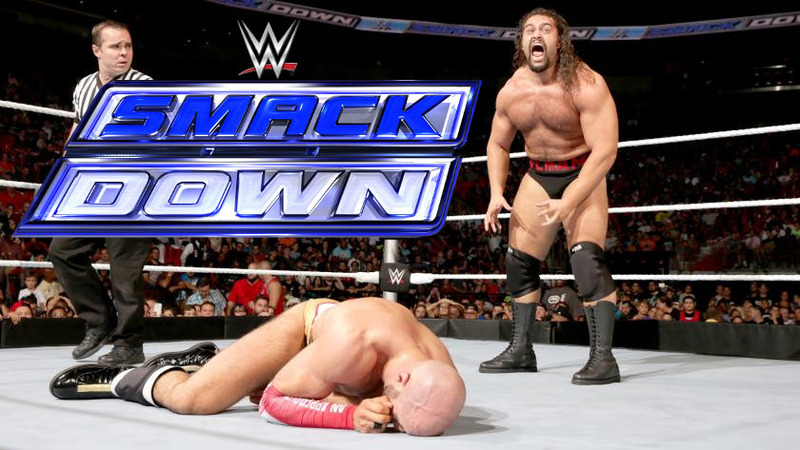 After the match, Del Rio attacks Cesaro by running him into the steps and stomping him from the apron to the floor. Rusev then heads to the ring and congratulates Cesaro. He wants to have their match right now. Great match. The injury to Cesaro really helped add to the drama and played a part in the match. They had some great segments in this match, especially the sequence leading up to the finish. Special Olympics athletes at the WWE Performance Center. Not a bad match. I actually enjoyed it. This was good for Dana Brooke too. I’m still not a big fan of hers, but she looked pretty good here, in part because this wasn’t a squash match. She overpowered Billie, but that’s what she should do. Billie Kay looked good in the match though, and actually had some nice offense. Hopefully we’ll see her again. Renee Young speaks with Sasha Banks. Sasha says she’s never been more focused. Summer Rae then walks up while texting. Summer speaks for everyone and says she’s sick of “The Boss.” Sasha then threatens Summer. Summer makes a face. Maryse introduces The Miz, and The Miz introduces Miz TV. Dean Ambrose doesn’t wait for his introduction. He heads to the ring. And he’s brought his lunch. Ambrose looks at Miz’s set, and Miz insults Mitch the Plant. They go back and forth a bit, then Miz calls Ambrose a joke. Miz thinks he represents WWE, not Ambrose. As Miz prepares for a fight, Ambrose uses Miz’s white suit jacket to wipe the mustard from his face. Maryse then tosses the jacket over Ambrose’s head, giving Miz an opening to boot Ambrose in the face. Pretty good match. Sasha kept the pace up and landed some tough-looking strikes. Summer was okay, though she did yell a lot. A possible Fatal Five Way is avoided. Good match. They did a lot in this match, and the energy remained high throughout. The outcome was never really in question, but this was a nice champ versus champ match, and a good main event. This was a good show. I really enjoyed the beginning, and the main event was nicely set up and well-executed. This was a highlight of the show and a great way to end an extended segment of the show.